We’re excited to announce some very positive changes to our ClearConnect service. The new changes are being rolled out gradually, but some of them will require activation by giving us a call. Follow links to your Facebook, Twitter, Google+ and a variety of other social media networks that your dental practice is on. Add the appointment to his/her calendar software wherever the email is viewed (on a desktop computer, tablet, or a smartphone). Get map/direction to the dental practice via Google or Bing. Instantly refer another patient to your office (requires a Clinicbook or an OpenCare account). In addition to the new email templates, we'd also like to remind our customers using automated voice phone call feature to take advantage of the free upgrade to use your own voice instead of robotic computer voice. This upgrade is free and based on the statistics collected in the last 12-month, the confirmation rate using voice has increased at least 15% after the switch. Further, most patients really love hearing the voice they are familiar with - yours! If you have not already done so, please contact our support to schedule the FREE upgrade. 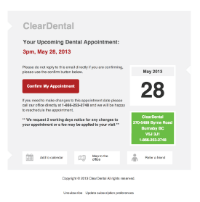 If you are interested in automating appointment confirmations, recall reminders, and much more, please visit http://www.cleardent.com/clearconnect.html or call your account manager at 1-866-253-2748, extension 1. We're currently doing a summer special for signing up with the ClearConnect service so hurry – the promotion ends on July 31, 2013. As well, Sinclair Dental and Dental Management Secrets will be joining us in presenting key guiding principles in Hi-tech Equipment Evaluation & Modernization, and Applied Practice Management Knowledge. It’s a breakout seminar not to be missed, and as a valued ClearDent customer, we're offering you a chance to win a FREE roundtrip flight to Las Vegas. For more information about the CE event and the FREE flight contest, please visit http://www.tbbw.ca/ or call 1-866-253-2748 x 6 and ask for Peter. We still have some room available for the upcoming training webinars on July 11 and September 19 with our head trainer Lisa. Lisa has been training ClearDent across Canada for over 6 years. Before she joined ClearDent, she’s a well respected office manager for a successful dental practice in Ontario. 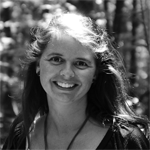 With her experience in both practice management and training ClearDent, her webinar is sure to give you new insights into what ClearDent can do for your practice. 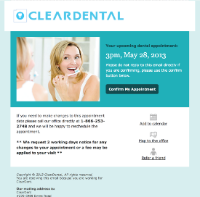 To learn more about the webinars and the agenda of the topics discussed, please visit http://www.cleardent.com/webinar. You can register online or call 1-866-253-2748 x 6. Did you know that ClearDent is on the following social networks? Never miss out on any promotions and also appreciation party invites. 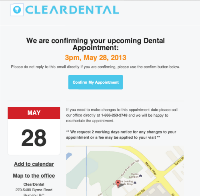 Get automatic discounts when attending our local ClearDent training courses. Know “the other side” of ClearDent - we share humorous office events and season’s greetings. As a thank you, if you follow us before August 1, 2013, simply send an email to info@cleardent.com and your office will get a chance to win a FREE lunch on us (up to $70 including tax and tips; draw will be made on August 16, 2013). This survey is taking place in order to enhance our provisions of Customer Service, Product Development, and Overall Experience. It will take approximately THREE MINUTES to complete the questionnaire. Your participation in this survey is completely voluntary. If you feel uncomfortable answering any questions, you can withdraw from the survey at any point. It is very important for us to hear from you and we strongly encourage you to provide us your feedback. Your survey responses will be strictly confidential and data from this research will be reported only in the aggregate. Your information will be encrypted and will remain confidential. If you complete the survey and provide your contact information (optional), you will also be entered for a chance to win a FREE lunch on us (up to $70 including tax and tips; draw will be made on entries submitted before August 16, 2013).